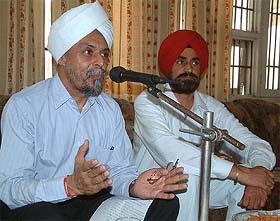 Jathedar Akal Takht, Giani Joginder Singh Vedanti, and Mr Parkash Singh Badal, president Shiromani Akali Dal may find themselves in a fix, even as the former SGPC secretary, Mr Kulwant Singh Randhawa today offered to appear before the Sikh clergy for undergoing ‘tankhah’ (punishment for religious misconduct) allegedly for conniving with Pro-Badal SGPC members. Mr Manpreet Badal, MLA of the Shiromani Akali Dal, today revealed that the unity between former Chief Minister Parkash Singh Badal and former SGPC chief Gurcharan Singh Tohra would be finalised well before the panchayat election scheduled for June 29. The functioning of the local labour court having jurisdiction over Bathinda, Mansa, Ferozepore, Muktsar and Faridkot districts has been adversely affected as there has been no presiding officer in the court for the past four months. The `Virasat Kala Kendra', a cultural training academy in Patiala, aims at preserving the treasure of Punjab's heritage by imparting specialised guidance in folk theatre, art and music to budding artistes of the day. A probe has been ordered into allegations against Dr Gurwinder Singh Samra, who was instrumental in the arrest of suspended Jalandhar District and Sessions Judge R.M. Gupta and UT Judicial Magistrate S.S. Bhardwaj, for allegedly defrauding ICICI Bank of about Rs 40 lakh. Dual stand on power tariff revision? Is the Punjab Government resorting to double standards as far as the revision of power tariff is concerned? Officially, the state government is for a rational hike in power tariff. Sahitya Kala Parishad, Government of Delhi, has conferred the prestigious Mohan Rakesh Award for the year 2003 on eminent Ludhiana-based playwright Dr. Gian Singh Mann. Dr. Mann has bagged the award for his Hindi play “Katha ek machhander ki”. The infighting between the groups led by Mr Hans Raj Nakra, district president of the local unit of the BJP, and Mr Tikshan Sud, MLA further intensified today when 45 BJP activists, including Mr Sat Pal Sareen, former President of the municipal council, Mr Gian Bansal, president of the district beopar cell of the party, Mr Ajay Jain, president of the city unit of the Bharatiya Janata Yuva Morcha, Mr Vijay Kumar, senior vice-president of the district unit of the party, belonging to Mr Sud’s group released a ‘White Paper’ against Mr Nakra. A meeting of office-bearers and executive members of the Shiromani Akali Dal will be held at Alamgir Gurdwara, near Ludhiana, on May 28, according to a party spokesperson. For a section of Punjab Police the Supreme Court order that no undertrial will be handcuffed except in special circumstances seems to have little effect as they handcuffed undertrials on the district court premises here today. Taking up a petition filed by former President of Malerkotla's Municipal Council Kewal Krishan Jindal alleging police inaction in an alleged assault case, Mr Justice K.C. Gupta of the Punjab and Haryana High Court today ordered that the investigation of the case should be handed over the Central Bureau of Investigation. Mr Mohinder Singh Sindhu, district president, Bar Association said today that the confidence of the people in the judicial system had started to wane. Mr Sidhu said this while welcoming Mr Justice J.S. Khehar Judge, Punjab and Haryana High Court, who was here today on an inspection. The Department of Posts has lost commission amounting to Rs 4.09 crore due from the Telecommunications Department following its failure to deduct it when they were made two separate departments. Unable to complete the inquiry about the cause of the fire aboard the Golden Temple Mail, the Commissioner, Railway Safety, has extended the term of the inquiry by another day. The CRS, Mr Bhupinder Singh, said though he had already formed an opinion about the possible cause of fire, he would wait for the forensic report to corroborate his findings, before making a statement. The Shiromani Gurdwara Prabandhak Committee had decided to give financial assistance to the victims of fire incident in the Golden Temple Mail and in a factory of Khud Mohalla area of Ludhiana recently. 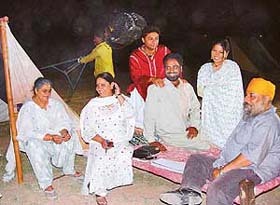 The true story about the reunion of a Pakistani woman with her long lost Indian son which has moved people on both sides of the border ever since it was broken by The Tribune about 23 years ago, is set to inspire them again at a time when the Indo-Pak ties are showing signs of a thaw. 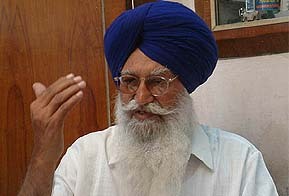 A section of Akali sarpanches of Nathana circle have decided to approach the SAD President, Mr Parkash Singh Badal, for action against party leaders who allegedly used derogatory remarks against a senior party worker in his absence while addressing a meeting on May 18 at Nathana town, 30 km from here. Mr Amarjit Singh Samra, Revenue and Rehabilitation Minister, today claimed that the Revenue Department had earned Rs 117.54 crore more as revenue fee during this financial year as compared to the last financial year due to efficient working of its employees. 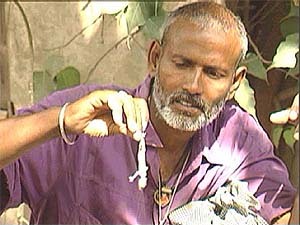 The Tarksheel Society today said that it would step up campaign against ‘tantriks’ misguiding people and making money by spreading superstitions. The society has been planning to strengthen its units in Bathinda, Mansa and Faridkot districts for the purpose. A team of the Vigilance Bureau, led by the DSP, Mr Brij Mohan Sarup, has detected evasion of market fee and rural development fund worth lakhs of rupees on the purchase of wheat by a local factory owner. Eleven new cases of gastroenteritis were reported from Onkar Nagar and adjoining Shivpuri localities since last night but medical authorities denied it. Today a case was reported from Shivpuri with Vijay Kumar (10) coming to ESI hospital last night. A court here has dismissed the anticipatory bail application of Suba Singh, a son of former Punjab Agriculture minister Gurdev Singh Badal, in a corruption case registered against him about a month back. The Punjab Law Forum in a press note said here yesterday that if no action was taken against the farmers polluting the environment by burning wheat stubble and paddy straw, they would move the High Court. Mr Surinder Arjun, Secretary, Durgiana Temple committee today refuted charges of Mr Surinder Kumar Billa, president, All-India Hindu Shiv Sena that the committee wanted to ‘eliminate’ him and that committee had become a den of corruption. A fire broke out in the premises of the Komal straw Board and Paper Mills on the Gurdaspur-Dera Baba Nanak road here at 7 pm last night. Two fire tenders which were rushed to the site, could not control the flames which spread with speed due to a squall. Hundreds of farmers including women today protested against the lack of civic amenities faced while depositing power bills at the focal point here. Farmers held a demonstration and raised slogans against the non-availability of drinking water and absence of shelter from summer heat. The Batala police has apprehended six members of a gang involved in incidents of murder, robbery and theft of vehicles in Batala, Amritsar, Hoshiarpur and New Delhi. The police claims to have solved a number of cases with their arrest. The CIA staff of Bahadur Singh Wala has claimed to have seized 88 kg of poppy husk during a raid in Pedhani village here last night. According to information, available, acting on a tip-off, the CIA staff of Bahadur Singh Wala yesterday raided Pedhani village and seized the contraband, which was concealed in a truck. Thousands of students of various courses being run by Punjab Technical University, Jalandhar, under its Virtual Online Campus have expressed apprehensions about the recognition and validity of the degrees, which they would be getting. The rule on the appointment of the Heads of Departments by rotation at Sant Longowal Institute of Engineering and Technology, Longowal, has been “violated” for the past more than one year. Students of Mohindra College today submitted a representation to Punjab School Education Board Chairman Kehar Singh to get the ten plus two maths paper re-evaluated due to large scale complaints of low marking.